IN GOD WE TRUST - a special story to start 2013! like the world is spiraling out of control….. Thanks to Kyler Meers for passing this along to us. Happy New Year Land Of ROCORI-ITES! The World You and I Live In... and are responsible for. Suomi NPP is NASA's next Earth-observing research satellite. It is the first of a new generation of satellites that will observe many facets of our changing Earth. Take a 2 minute break... you deserve it! 3 min. Take a look at what you get when you mount a motion camera in the woods during the middle of the summer. Morning... noon and night. A few weeks ago DigElogROCORI took part in a special tour of the the new County Park in Rockville, MN. 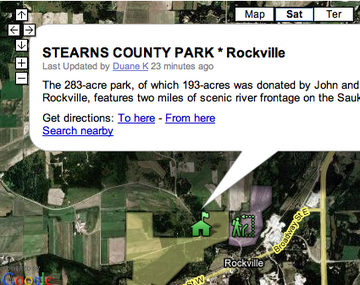 The new Stearns County park is located directly west of the recently established Eagle Park on the north side of the Sauk River in Rockville. On this day the Stearns County Park staff held an open house for the general public to showcase the natural beauty of the park and to get input on what future usage and development should be. 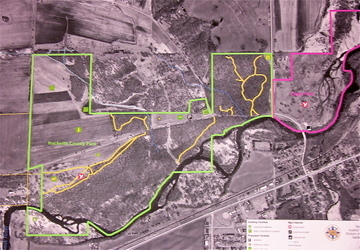 The open house included maps showing the present features of the park, as well as short hiking tours to highlight some of its unique characteristics. In this story, you’ll meet Stearns County Park Director, Chuck Wocken. Chuck begins by giving us a personal tour of a pristine babbling brook that can be found in the park. 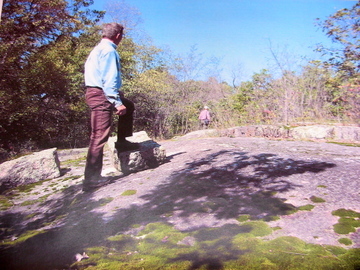 Wocken talks about the natural beauty of the area and how the County plans to create trails within the park that do not disrupt the magnificence of the wooded area. Future plans for the park possibly include picnic areas with a play structure and shelter, canoeing, camping, fishing, hiking, cross-country ski trails, environmental education and possibly horseback riding. 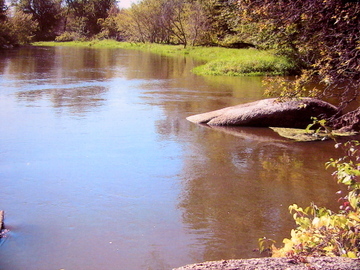 The 283-acre park, of which 193-acres was donated by John and Linda Peck of Rockville, features two miles of scenic river frontage on the Sauk River. This story is about the start of the Walk N Wheel Trail that will be constructed this summer around Assumption Campus and along Brewery Creek in Cold Spring. This story introduces the work starting this spring to restore the natural environment along Brewery Creek as a part of a special Mn DNR grant. Erik Burr, director of environmental services at Assumption home, joins Greg Berg with the Stearn's County Soil and Water District to discuss this important project for the community and ROCORI area.